Kevin Epling father of Matt Epling, for which Michigans Safe School Law is named moderated a series of panelists took part in a TED-style talk to share how bullying affects their sectors and what attendees should know. 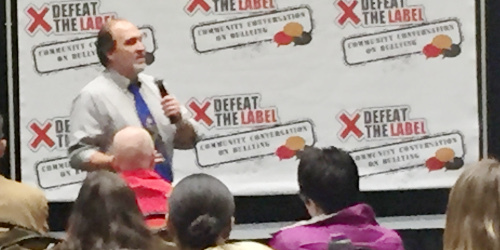 NOVI – More than 200 teachers, administrators, counselors, parents, and community members gathered Oct. 17 at the First Annual “Defeat the Label Community Conversation on Bullying” at the Suburban Collection Showplace in Novi. The conversation was moderated by Kevin Epling – father of Matt Epling, for which Michigan’s Safe School Law is named. A series of panelists took part in a TED-style talk to share how bullying affects their sectors and what attendees should know. “Addressing bullying is a huge issue that comprises many disciplines,” said Jamie Greene, executive director for Defeat the Label. The key messages delivered at the event show that students and parents want to feel empowered and that they have the ability to make a change in their schools and community. Following a keynote address by Dr. Stephen Smith of the University of Southern California Shoah Foundation, breakout sessions gave attendees an opportunity to create a comprehensive, pro-active anti-bullying platform. Panelists included Glenn Stutzky, MSW, Michigan State University School of Social Work; Tom Holt, PhD, Michigan State University School of Criminal Justice; Saleem Alhabash, PhD, Michigan State University College of Communication Arts and Sciences; Dr. Marlene Seltzer, Beaumont Hospital/NoBLE Clinic; U.S. Attorney for the Eastern District Barbara McQuade; Michigan State Supreme Court Justice Richard Bernstein; and Kenneth Gutman, Walled Lake Superintendent. “It was an outstanding conference where student ambassadors from different school districts were present, and they play a vital role in carrying this conversation forward,” Bernstein said. Epling said, “You have to have heroes in your hallway” when he spoke with Michigan Radio online Oct. 13 in advance of the event. ACLU LGBT Staff Attorney Jay Kaplan points to the Patterson v. Hudson Area Schools federal lawsuit filed against a Michigan school district where disciplinary procedures to address the bullying of a student suspected of being gay were ineffectual. Since the State Board of Education approved a set of guidelines designed to protect LGBTQ students, conservative lawmakers in particular have been critical. Epling recalls the big battle back in 2005 when he was dragged into discussions about policy and law. Epling clarified his statement on Oct. 25. Joining Epling during the radio show was Suzanne Spurr, a counselor from Chippewa Valley High School in Clinton Township. For more information, visit the Defeat the Label website, email info@defeatthelabel.com or call 248-962-3851.